whaticookedwhatiwore | delicious food. tasty clothes. at a lovely wedding i attended recently in stern grove. life is so full. and for the most part, in great ways. yet i have that definite desire for spaciousness – a second cup of tea, a lazy conversation & longer stretches of silence. i try to use sunday afternoons to prepare for the week so that weekday mornings don’t feel rushed (i become less of a morning person when i have to go work) & i don’t feel d-o-n-e at days’ end. stuffed peppers are a great cook-them-now-eat-them-later dish as they get even better after a day. i am not a fan of green bell peppers so, as always, use what you like – that includes using something else, like zucchini, if you don’t like peppers. cut around the stem of the peppers so there is a hole in the tops & empty the seeds. place in a baking dish into which they fit snugly. add the olive oil and onions to a large skillet & saute until soft. add beef & brown. add rice and stir well. add herbs, chilis, salt & pepper. there should be some liquid from the meat in the pan – if not, add a bit of water, about 1/4 cup, and cover for 15 minutes. add pignoles, parmesan & parsley. 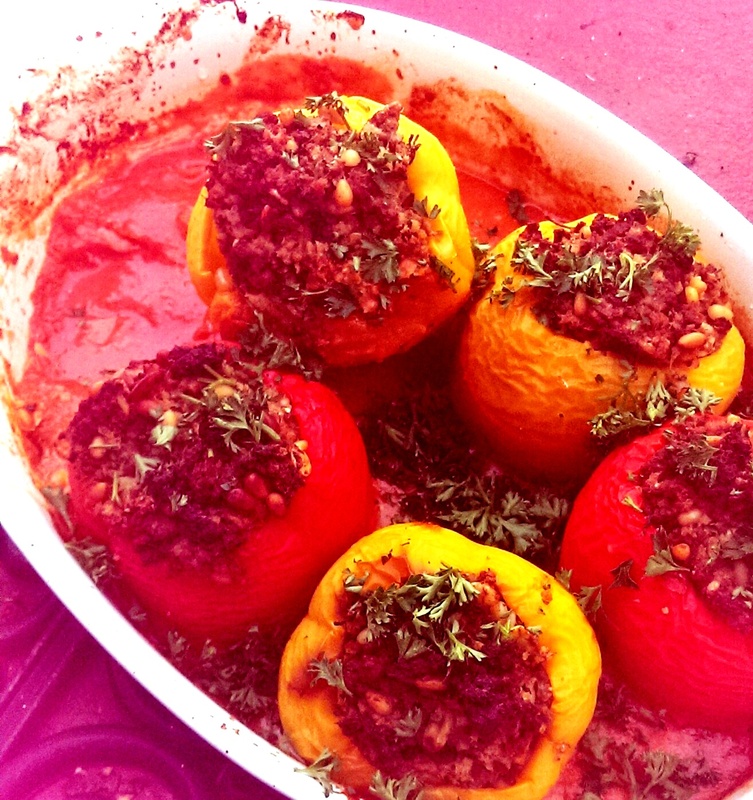 spoon mixture into peppers & pour sauce into baking dish around peppers. bake until peppers are soft, about 1 hour. i miss you on these foggy mornings. we are spoiled here by the abundance of fruit trees that grow seemingly in everyone’s backyard – cherries, avocados, apples, pears, figs, meyer lemons, conventional lemons & so it goes. the other day we were at a bbq & the lemon tree in the backyard was… something special. the lemons were huge. and by huge i mean conversation-stopping & then oh-my-god-did-you-see-the-size-of-those-lemons-huge (see scientific comparison documentation photo below). the kids played football with one. our endlessly creative waldorf teacher friend made a puppet with another. and i made a triple recipe of lemon curd with mine. this is a tangy curd – you may want to increase the sugar – but i love its lemony-ness. over the weekend we had it on pancakes that the boy made (recipe coming soon!). it would also be great on toast with butter or as a filling for a fruit tart with fruits from, if you’re lucky, your & your neighbor’s backyard. whisk the eggs, sugar and zest together in a medium stainless-steel saucepan. add the lemon juice & butter. continue to whisk while cooking over a medium flame until the butter has melted & the mixture is thick. reduce heat to low & simmer for a few minutes. * serve warm or cover surface of curd with wax paper and cool completely. *i like the texture of the zest; however, if you prefer a smooth consistency, force curd through a fine sieve set into another bowl. the egg is for scale. and for the lemon curd. apropos of my recent cooking-with-corn-in-april post, seen here, today i bought a big bag of fat, in-season cherries. so good straight from the bag, sweet cherries disappear with a quickness in my boy’s small brown hands. but i recently came across a couple of recipes that maintain the texture & juicy cherry-ness of these stone fruits while switching things up a bit. plus, in my world, pie is always in season. in a bowl, combine first five ingredients. mound by spoonfuls onto one end of each rectangle. fold over & seal the edges decoratively with the tines of a fork & brush the tops with the beaten egg. sprinkle the tops with sanding sugar & place each hand pie on a parchment-lined baking sheet. bake for 30 minutes or until puffed & golden brown.